Asiana Visa® Business Card is a small business credit card with an annual fee of $80 per company. It’s designed for business owners who frequently fly with Asiana Airlines, a Republic of Korea-based airline that primarily serves its home country, Japan, much of mainland Asia, Oceania, and North America. Most long-haul Asiana routes connect through Korea. This card is the business equivalent of Asiana Visa Signature Credit Card, a consumer-facing product with somewhat different rates, terms, and benefits. When you sign up for either card, you automatically earn and maintain free membership in Asiana Club, Asiana’s frequent flyer program. Every purchase made with Asiana Visa Business Card earns Asiana loyalty miles, with no caps or restrictions. You get 2 miles for every $1 spent with Asiana Airlines, including on airfare, in-flight purchases, upgrades, and incidentals. All other purchases earn 1 mile per $1 spent. Miles can be redeemed for award travel on Asiana Airlines and more than 2 dozen Star Alliance partners, including United Airlines. Beyond the mileage earnings, this card offers 2 separate $100 airfare credits each year. They’re automatically applied as statement credits against Asiana flights originating in the United States. First-time users get 10,000 bonus miles after making their first purchases, too. That’s enough for a round-trip flight within Korea. 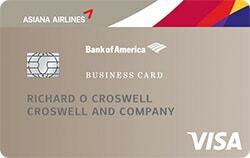 If you frequently travel for business on Asiana Airlines, this card is definitely worth checking out. Here’s what you need to know about it. When you open your account and make your first purchase, you earn 10,000 bonus miles. This is enough for a round-trip flight within the Republic of Korea, and about 14% of the total mileage necessary to earn a free round-trip economy ticket from the U.S. to Korea (or 28% of the total mileage necessary to earn a one-way economy ticket). All Asiana Airlines purchases earn 2 miles per $1 spent. That includes airfare, in-flight purchases, baggage upgrades, and other incidentals. All other purchases earn 1 mile per $1 spent. When you use your card for airfare purchases, your miles accrue on top of the base miles earned by all Asiana Club members. A given flight’s base mile earnings is proportional to its actual distance in miles – for instance, an economy one-way flight between Incheon and New York earns 6,865 base miles, plus 2 miles for each dollar spent on the Asiana card. There is no limit to the number of base or bonus miles you can earn. The best redemption option is usually Asiana airfare, with redemption thresholds starting at 10,000 miles for economy round-trip flights within the Republic of Korea, 30,000 miles for economy round trips within Northeast Asia, and 70,000 miles for economy round trips between Korea and North America. It’s difficult to ascribe precise redemption values to miles due to variations in Asiana flights underlying cash prices, which themselves vary by time, date, season, demand, and other factors. However, miles are very generally worth between $0.01 and $0.05 apiece at redemption. Asiana also allows you to redeem for class upgrades, which costs a bit less than redeeming for actual airfare. For instance, an economy-to-business upgrade on a round-trip flight from Korea to North America requires 60,000 miles. As is always the case with travel loyalty programs, these values are subject to change without notice. Finally, as part of the global Star Alliance, Asiana allows redemptions for award travel with more than 25 Star Alliance airline partners, including United Airlines and Air Canada. Within North America, partner redemptions start at 25,000 miles per round-trip flight. These redemption values are subject to change at any time at the discretion of Asiana and its Star Alliance partners. Every year your account remains open and in good standing, you receive 2 separate $100 airfare credits against Asiana Airlines airfare originating in the U.S. These credits are automatically applied to your account balance. If you have a business deposit account with Bank of America, you can link it to this card account and take advantage of BoA’s overdraft protection coverage. In the event of a checking account transaction that would normally produce a negative account balance, BoA automatically draws a cash advance (Overdraft Cash Advance) on your Asiana card to cover the shortfall. This service costs the greater of $10 or 3% per occurrence. Transferred balances immediately begin accruing interest at the current cash advance rate. 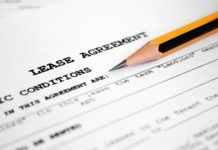 There is an $80 annual fee per company, regardless of the number of authorized users. The foreign transaction fee is 3%. Cash advances (except overdraft protection advances) and balance transfers cost the greater of $10 or 4%. Late payments cost up to $49, while returned payments cost $39. Annual Airfare Credits More Than Offset Annual Fee. Asiana Visa Business Card’s annual airfare credits total $200 – more than twice the annual fee. As long as you fly Asiana at least once each year, this benefit alone is worth the application. Can Redeem With More Than 25 Star Alliance Partners. You can redeeem your accumulated Asiana miles with more than 25 Star Alliance partners, including popular U.S. airlines such as United Airlines. If you travel within the Americas or other parts of the world not heavily served by Asiana Airlines, this is a critical benefit that really enhances your Asiana Visa Business Card’s versatility. Somewhat More Permissive Qualification Standards. To qualify for this card, you need to have good credit. However, that’s actually a lower standard than the Asiana Visa Signature Credit Card, the consumer equivalent. That card requires excellent credit, meaning any notable credit blemishes could prove disqualifying. No Authorized User Fee. This card doesn’t have an authorized user or employee card fee, meaning you can add as many employees as you want without paying extra. You simply pay $80 per year, per company. By contrast, some high-end business cards, such as American Express Business Platinum, charge recurring fees for additional cards. No Penalty APR. This card doesn’t charge penalty interest. If you occasionally miss payments due to cash flow issues or other problems, you don’t have to worry about getting locked into a higher interest rate indefinitely. Some comparable cards, including Asiana Visa Signature Credit Card, charge penalty interest rates as high as 29.99% APR. Charges an Annual Fee. Asiana Visa Business Card charges a somewhat-steep $80 annual fee. If you’re a light to moderate spender who doesn’t travel Asiana frequently enough to take full advantage of the airfare credits, it’s unlikely that you’ll earn sufficient rewards (or extract sufficient value in other ways) to offset this recurring levy. Has a Foreign Transaction Fee. This card has a 3% foreign transaction fee. That’s unusual (and unwelcome) for a travel rewards credit card geared toward international travelers. Sign-up Bonus Is Paltry. Asiana Visa Business Card’s 10,000-mile sign-up bonus is easy to attain – you just have to make a single purchase. However, by the standards of other business travel cards, it’s not particularly impressive. With round-trip award flights from the U.S. to Korea starting at 70,000 miles, you’d need 7 of these bonuses to get a totally free trans-Pacific flight. Costly Redemptions for U.S.-Based Travelers. If your business is based in the U.S. and you (or your employees) travel relatively infrequently, it’s likely to take many months before you earn enough points to redeem for trans-Pacific Asiana Airlines flights. Though you can avoid high redemption minimums by redeeming on partner flights within North America, but that’s of limited value if business regularly takes you to Asia. The best use case for this card involves U.S. citizen or permanent resident business owners who spend a great deal of time (or actually live) in Korea or other areas of Northeast Asia, where it’s far faster and easier to redeem for Asiana award travel. It’s indisputable that Asiana Visa Business Card is less generous than Asiana Visa Signature Credit Card, its consumer counterpart. Asiana Visa Signature’s sign-up bonus is 3 times as large as Asiana Visa Business’s. Asiana Visa Signature earns 3 miles per $1 spent on Asiana Airlines purchases, compared with Asiana Visa Business’s 2 miles per $1 spent. And Asiana Visa Signature cardholders get 10,000 bonus miles every year their accounts remain open and in good standing – a useful benefit that’s completely absent on the business side of things. Here’s the bottom line. While the Asiana Visa® Business Card is probably better than no business travel rewards credit card at all, it’s not the gold standard. If you frequently travel to Asia for business and personal reasons, you should consider pairing Asiana Visa Signature with a non-Asiana business card that offers better terms and benefits on long-haul business travel. The Asiana Visa® Business Card is geared toward small business owners and employees who spend lots of time in Korea or other parts of Northeast Asia – Asiana Airlines’ operational center of gravity. Due to the somewhat laid-back qualification standards, this card is also useful for newer businesses seeking to build credit. However, the foreign transaction fee makes it a less than ideal choice for everyday spending in international settings – it’s far better to use it to purchase expensive airfare, and switch to a card that waives foreign transaction fees in-country. The Asiana Airlines Visa Business Card’s top benefits include its generous annual airfare credit, relatively permissive qualification standards, ability to redeem miles with more than 25 Star Alliance partner airlines, no authorized user or employee card fee, and no penalty APR. The principal drawbacks include the $80 annual fee, the 3% foreign transaction fee, the paltry sign-up bonus, and the costly redemptions for U.S.-based travelers. Overall, this isn’t a bad card for international business travelers, but better options exist for those with excellent credit.